Lee Jun-fan (Chinese: ??? 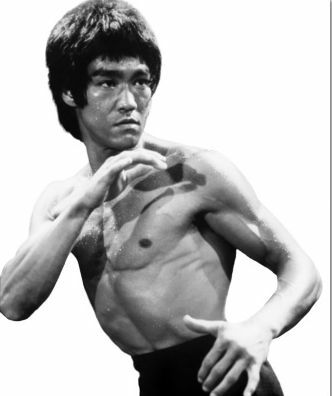 ; November 27, 1940 � July 20, 1973), known professionally as Bruce Lee (Chinese: ??? 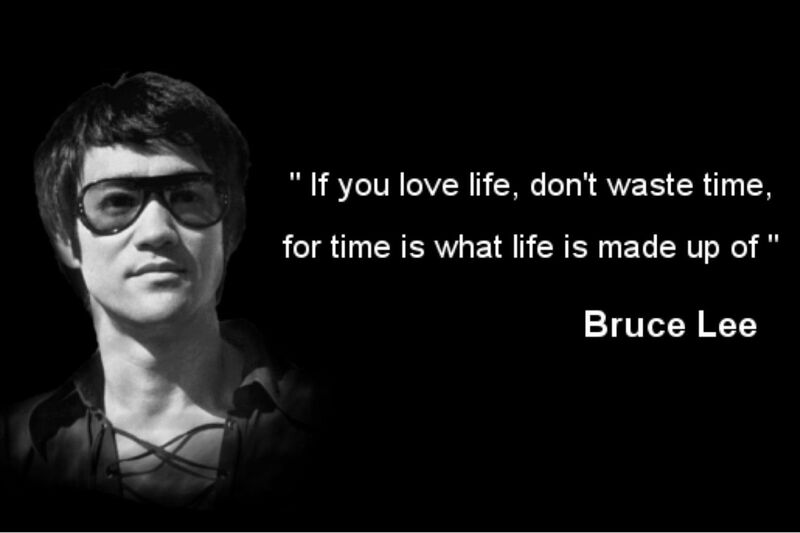 ), was a Hong Kong and American actor, film director, martial artist, martial arts instructor, philosopher, and founder of the martial art Jeet Kune Do, one of the wushu or kungfu styles. Lee was the son of Cantonese opera star Lee Hoi-chuen. 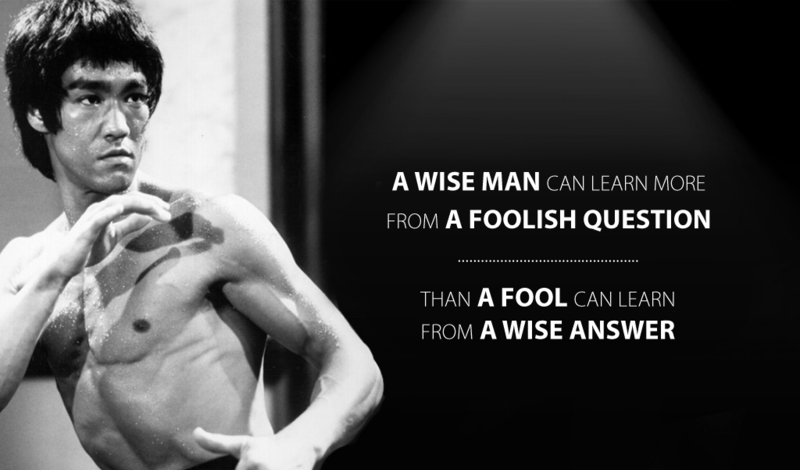 He is widely considered by commentators, critics, media, and other martial artists to be one of the most influential martial artists of all time, and a pop culture icon of the 20th century. He is often credited with helping to change the way Asians were presented in American films. 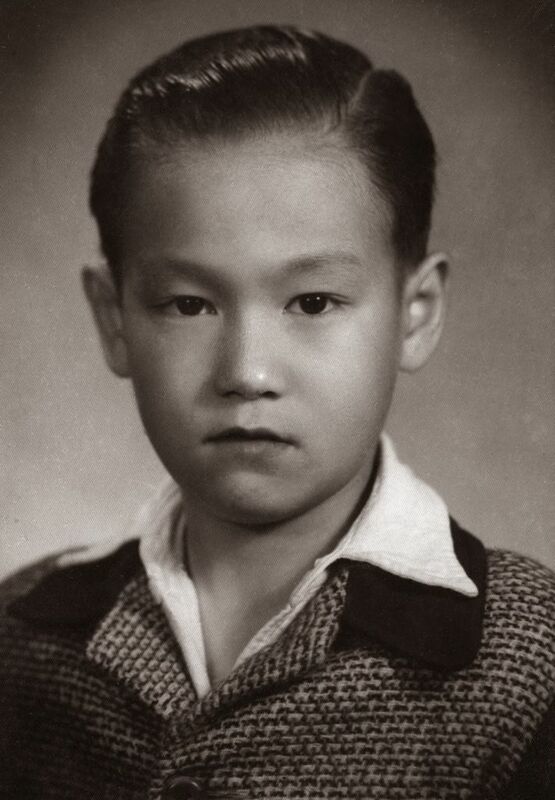 Lee was born in Chinatown, San Francisco, on November 27, 1940, to parents from Hong Kong, and was raised in Kowloon, Hong Kong, with his family, until his late teens. He was introduced to the film industry by his father, and appeared in several films as a child actor. Lee moved to the United States at the age of 18 to receive his higher education at the University of Washington, in Seattle, and it was during this time that he began teaching martial arts. His Hong Kong and Hollywood-produced films elevated the traditional Hong Kong martial arts film to a new level of popularity and acclaim, sparking a surge of interest in Chinese martial arts in the West in the 1970s. 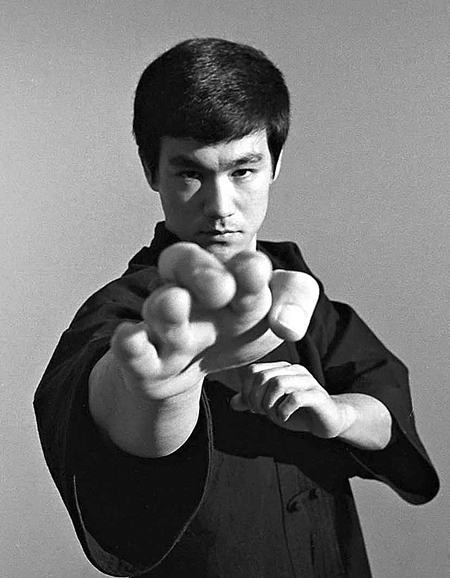 The direction and tone of his films changed and influenced martial arts and martial arts films in the US, Hong Kong, and the rest of the world. 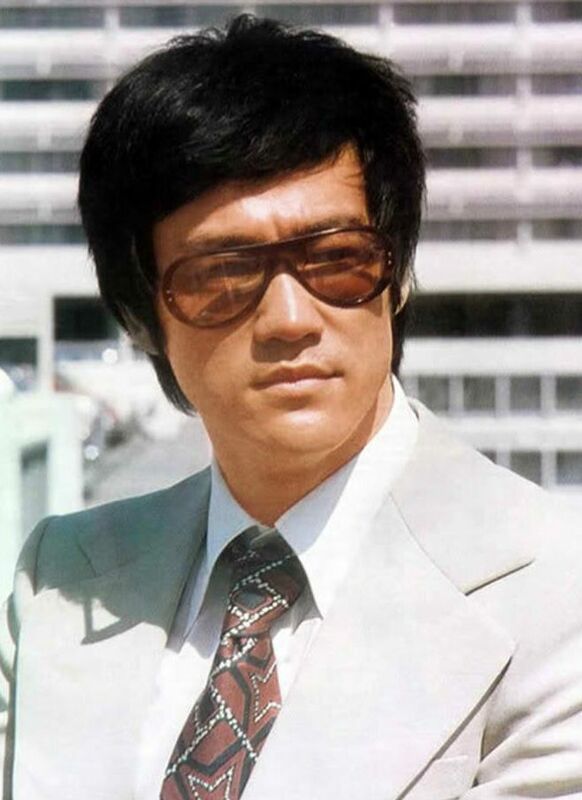 He is noted for his roles in five feature-length films: Lo Wei's The Big Boss (1971) and Fist of Fury (1972); Golden Harvest's Way of the Dragon (1972), directed and written by Lee; Golden Harvest and Warner Brothers' Enter the Dragon (1973) and The Game of Death (1978), both directed by Robert Clouse. Lee became an iconic figure known throughout the world, particularly among the Chinese, as he portrayed Chinese nationalism in his films. 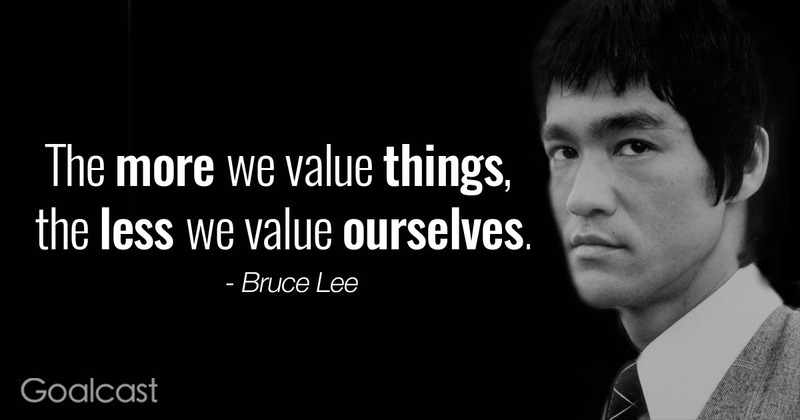 He trained in the art of Wing Chun and later combined his other influences from various sources into the spirit of his personal martial arts philosophy, which he dubbed Jeet Kune Do (The Way of the Intercepting Fist). Lee held dual nationality in Hong Kong and the US. He died in Kowloon Tong on July 20, 1973, at the age of 32. 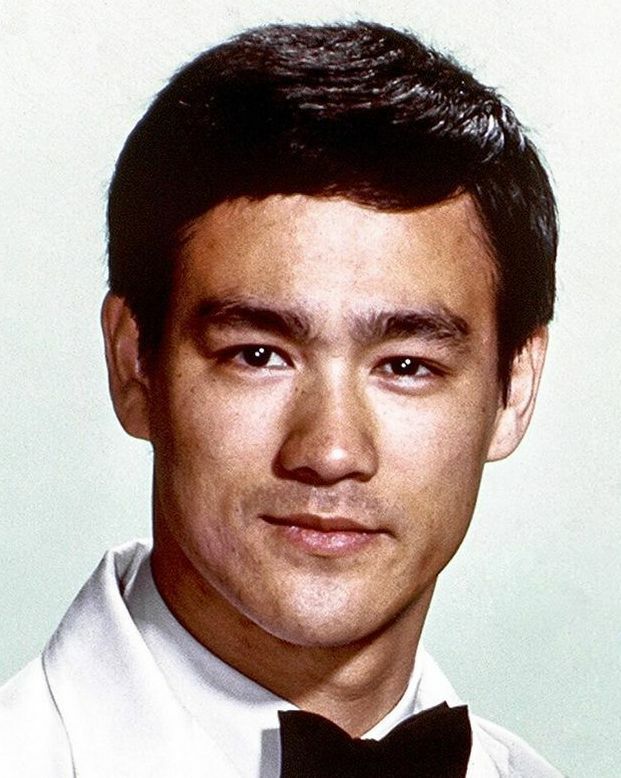 Bruce Lee was born on November 27, 1940, at the Chinese Hospital, in San Francisco's Chinatown. According to the Chinese zodiac, Lee was born in both the hour and the year of the Dragon, which according to tradition is a strong and fortuitous omen. Lee and his parents returned to Hong Kong when he was three months old. Bruce's father, Lee Hoi-chuen, (???) was Han Chinese, and his mother, Grace Ho (??? ), was of Eurasian ancestry. Grace Ho was the adopted daughter of Ho Kom-tong (Ho Gumtong, ???) and the half-niece of Sir Robert Ho-tung, both notable Hong Kong businessmen and philanthropists. Bruce was the fourth of five children: Phoebe Lee (??? ), Agnes Lee (??? ), Peter Lee (??? ), and Robert Lee (???). Grace's parentage remains unclear. 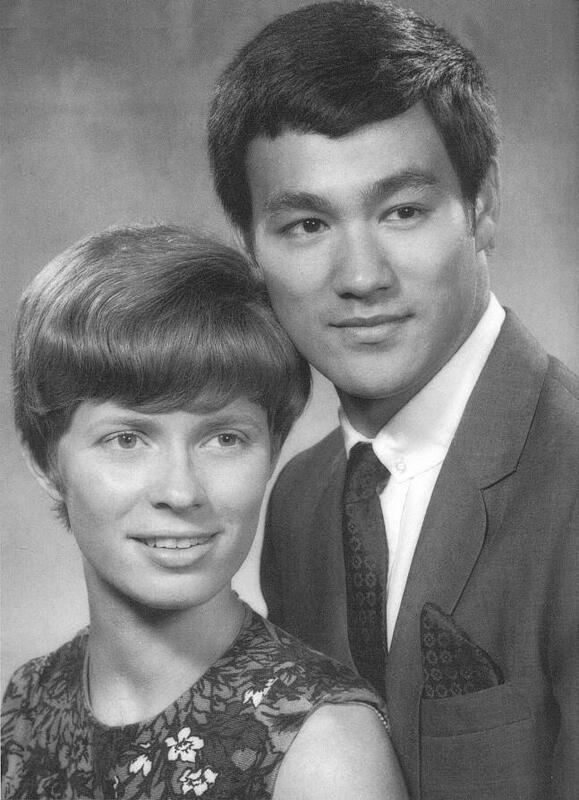 Linda Lee, in her 1989 biography The Bruce Lee Story, suggests that Grace had a German father and was a Catholic. Bruce Thomas, in his influential 1994 biography Bruce Lee: Fighting Spirit, suggests that Grace had a Chinese mother and a German father. Lee's relative Eric Peter Ho, in his 2010 book Tracing My Children's Lineage, suggests that Grace was born in Shanghai to a Eurasian woman named Cheung King-sin. Lee's Cantonese birth name was Lee Jun-fan (???). The name homophonically means "return again", and was given to Lee by his mother, who felt he would return to the United States once he came of age. Because of his mother's superstitious nature, she had originally named him Sai-fon (?? ), which is a feminine name meaning "small phoenix". The English name "Bruce" is thought to have been given by the hospital attending physician, Dr. Mary Glover. Lee had three other Chinese names: Lee Yuen-cham (??? ), a family/clan name; Lee Yuen-kam (??? ), which he used as a student name while he was attending La Salle College, and his Chinese screen name Lee Siu-lung (??? ; Siu-lung means "little dragon"). Lee's given name Jun-fan was originally written in Chinese as ? ?, however, the Jun (?) Chinese character was identical to part of his grandfather's name, Lee Jun-biu (???). Hence, the Chinese character for Jun in Lee's name was changed to the homonym ? instead, to avoid naming taboo in Chinese tradition. Lee's father, Lee Hoi-chuen, was one of the leading Cantonese opera and film actors at the time, and was embarking on a year-long opera tour with his family on the eve of the Japanese invasion of Hong Kong. Lee Hoi-chuen had been touring the United States for many years and performing in numerous Chinese communities there. Although many of his peers decided to stay in the US, Lee Hoi-chuen returned to Hong Kong after Bruce's birth. Within months, Hong Kong was invaded and the Lees lived for three years and eight months under Japanese occupation. After the war ended, Lee Hoi-chuen resumed his acting career and became a more popular actor during Hong Kong's rebuilding years. Lee's mother, Grace Ho, was from one of the wealthiest and most powerful clans in Hong Kong, the Ho-tungs. She was the half-niece of Sir Robert Ho-tung, the Eurasian patriarch of the clan. 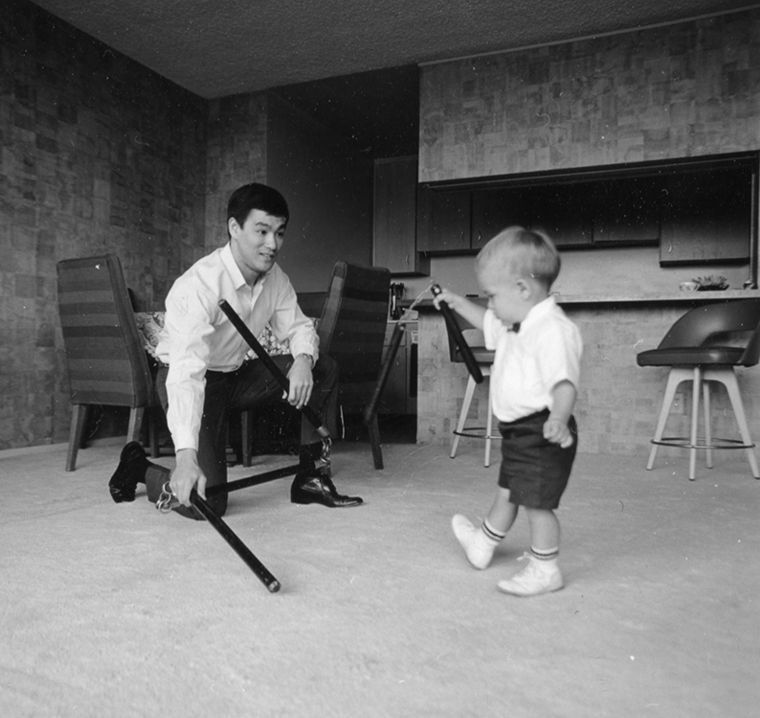 As such, the young Bruce Lee grew up in an affluent and privileged environment. Despite the advantage of his family's status, the neighborhood in which Lee grew up became overcrowded, dangerous, and full of gang rivalries due to an influx of refugees fleeing communist China for Hong Kong, at that time a British Crown colony. 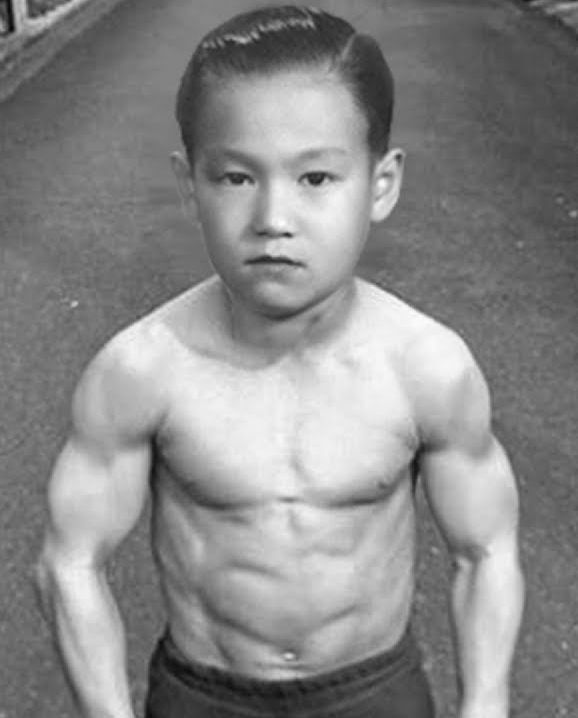 After Lee was involved in several street fights, his parents decided that he needed to be trained in the martial arts. 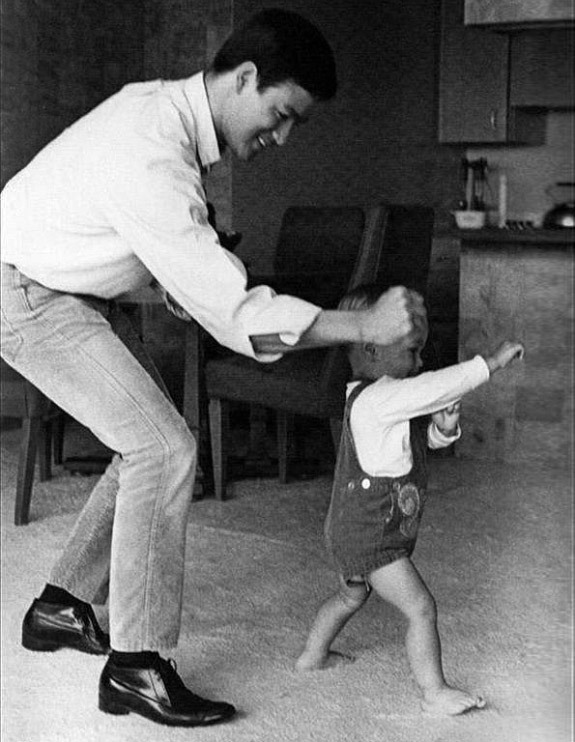 Lee's first introduction to martial arts was through his father, from whom he learned the fundamentals of Wu-style t'ai chi ch'uan. The largest influence on Lee's martial arts development was his study of Wing Chun. Lee began training in Wing Chun when he was 16 years old under the Wing Chun teacher Yip Man in 1957, after losing several fights with rival gang members. Yip's regular classes generally consisted of the forms practice, chi sao (sticking hands) drills, wooden dummy techniques, and free-sparring. There was no set pattern to the classes. Yip tried to keep his students from fighting in the street gangs of Hong Kong by encouraging them to fight in organized competitions. After a year into his Wing Chun training, most of Yip Man's other students refused to train with Lee when they learned of his mixed ancestry, as the Chinese were generally against teaching their martial arts techniques to non-Asians. Lee's sparring partner, Hawkins Cheung, states, "Probably fewer than six people in the whole Wing Chun clan were personally taught, or even partly taught, by Yip Man". However, Lee showed a keen interest in Wing Chun, and continued to train privately with Yip Man and Wong Shun Leung in 1955. Wan Kam Leung, a student of Wong's, witnessed a sparring bout between Wong and Lee, and noted the speed and precision with which Lee was able to deliver his kicks. Lee continued to train with Wong Shun Leung after later returning to Hong Kong from America. After attending Tak Sun School (????) (several blocks from his home at 218 Nathan Road, Kowloon), Lee entered the primary school division of the Catholic La Salle College at the age of 12. In 1956, due to poor academic performance (or possibly poor conduct as well), he was transferred to St. Francis Xavier's College (high school), where he would be mentored by Brother Edward, a teacher and coach of the school boxing team. In 1958 Bruce won the Hong Kong schools boxing tournament, knocking out the previous champion in the final. In the spring of 1959, Lee got into another street fight and the police were called. Until his late teens, Lee's street fights became more frequent and included beating the son of a feared triad family. Eventually, Lee's father decided his son should leave Hong Kong to pursue a safer and healthier life in the United States. His parents confirmed the police's fear that this time Lee's opponent had an organised crime background, and there was the possibility that a contract was out for his life. In April 1959, Lee's parents decided to send him to the United States to stay with his older sister, Agnes Lee (??? ), who was already living with family friends in San Francisco. Chow's husband was a co-worker and friend of Lee's father. Lee's elder brother Peter Lee (???) would also join him in Seattle for a short stay before moving on to Minnesota to attend college. In December 1960, Lee completed his high school education and received his diploma from Edison Technical School (now Seattle Central Community College, located on Capitol Hill in Seattle). In March 1961, Lee enrolled at the University of Washington, majoring in drama according to a 1999 article in the university's alumni magazine, not in philosophy as stated by Lee himself and many others. Lee also studied philosophy, psychology, and various other subjects. It was at the University of Washington that he met his future wife Linda Emery, a fellow student studying to become a teacher, whom he married in August 1964. 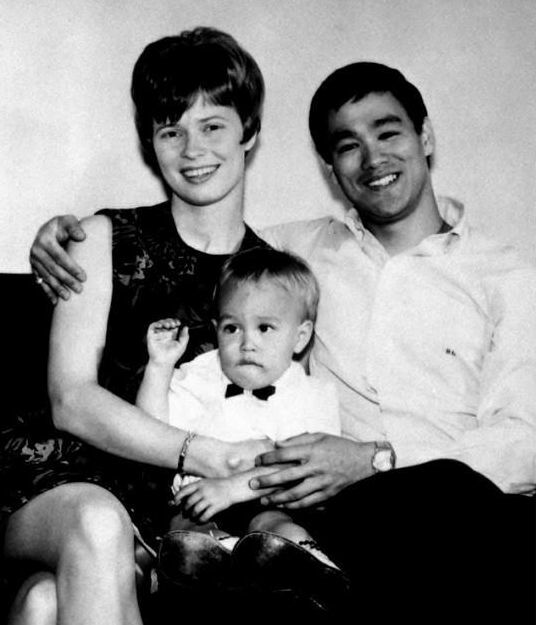 Lee had two children with Linda Emery, Brandon Lee (1965�1993) and Shannon Lee (born 1969). Lee began teaching martial arts in the United States in 1959. 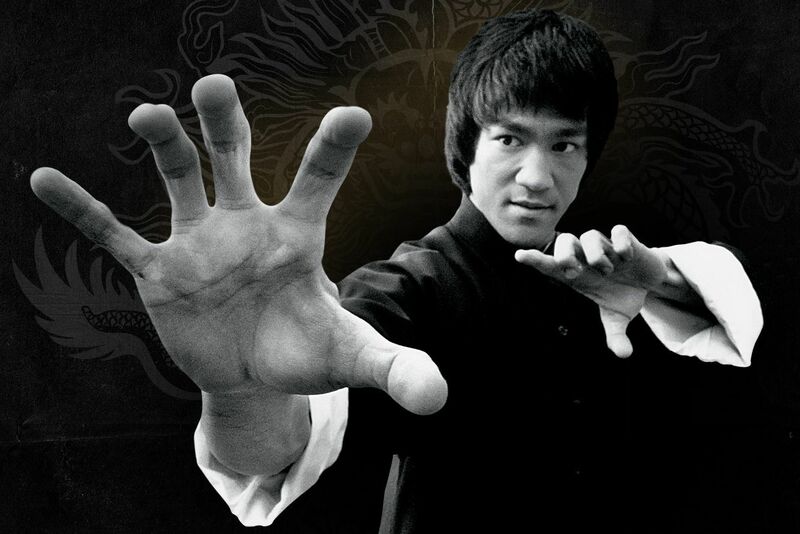 He called what he taught Jun Fan Gung Fu (literally Bruce Lee's Kung Fu). It was basically his approach to Wing Chun. Lee taught friends he met in Seattle, starting with Judo practitioner Jesse Glover, who continued to teach some of Lee's early techniques. Taky Kimura became Lee's first Assistant Instructor and continued to teach his art and philosophy after Lee's death. Lee opened his first martial arts school, named the Lee Jun Fan Gung Fu Institute, in Seattle. Lee dropped out of college in the spring of 1964 and moved to Oakland to live with James Yimm Lee (???). 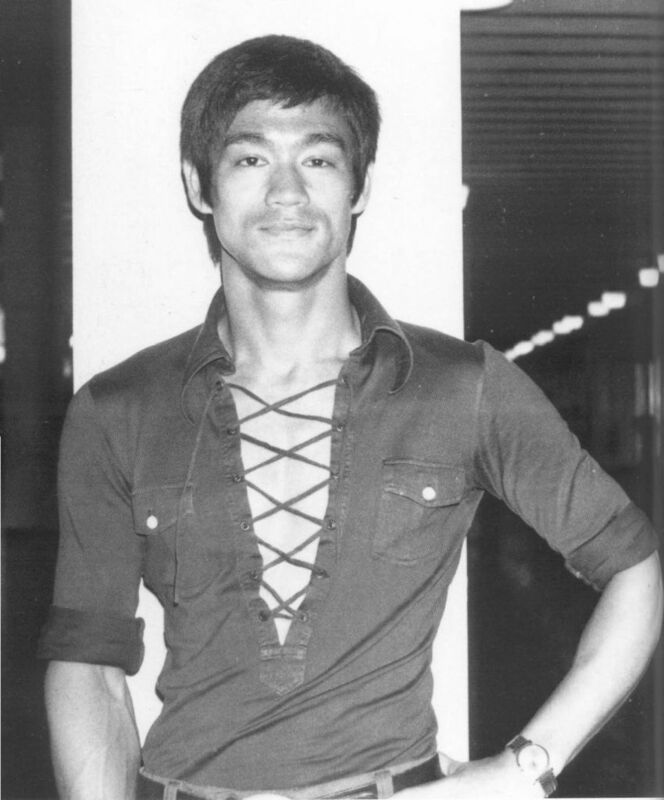 James Lee was twenty years senior to Bruce Lee and a well-known Chinese martial artist in the area. Together, they founded the second Jun Fan martial arts studio in Oakland. 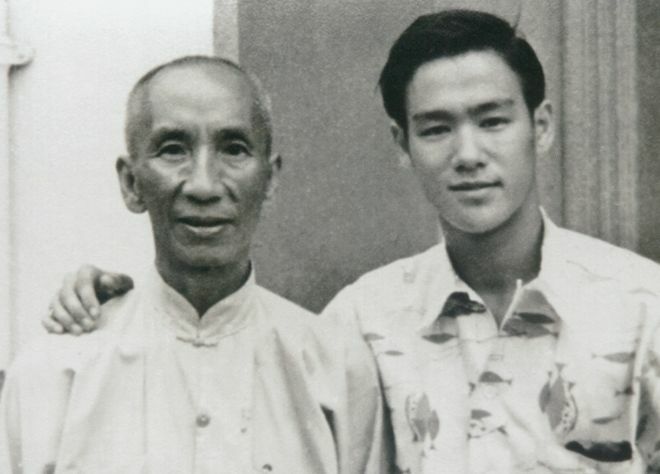 James Lee was also responsible for introducing Bruce Lee to Ed Parker, American martial artist, and organizer of the Long Beach International Karate Championships, at which Bruce Lee was later "discovered" by Hollywood. At the invitation of Ed Parker, Lee appeared in the 1964 Long Beach International Karate Championships and performed repetitions of two-finger push-ups (using the thumb and the index finger of one hand) with feet at approximately shoulder-width apart. In the same Long Beach event he also performed the "One inch punch." Lee stood upright, his right foot forward with knees bent slightly, in front of a standing, stationary partner. Lee's right arm was partly extended and his right fist approximately one inch (2.5 cm) away from the partner's chest. Without retracting his right arm, Lee then forcibly delivered the punch to his partner while largely maintaining his posture, sending the partner backwards and falling into a chair said to be placed behind the partner to prevent injury, though his partner's momentum soon caused him to fall to the floor. His volunteer was Bob Baker of Stockton, California. "I told Bruce not to do this type of demonstration again", Baker recalled. "When he punched me that last time, I had to stay home from work because the pain in my chest was unbearable". It was at the 1964 championships that Lee first met Taekwondo master Jhoon Goo Rhee. The two developed a friendship � a relationship from which they benefited as martial artists. Rhee taught Lee the side kick in detail, and Lee taught Rhee the "non-telegraphic" punch. 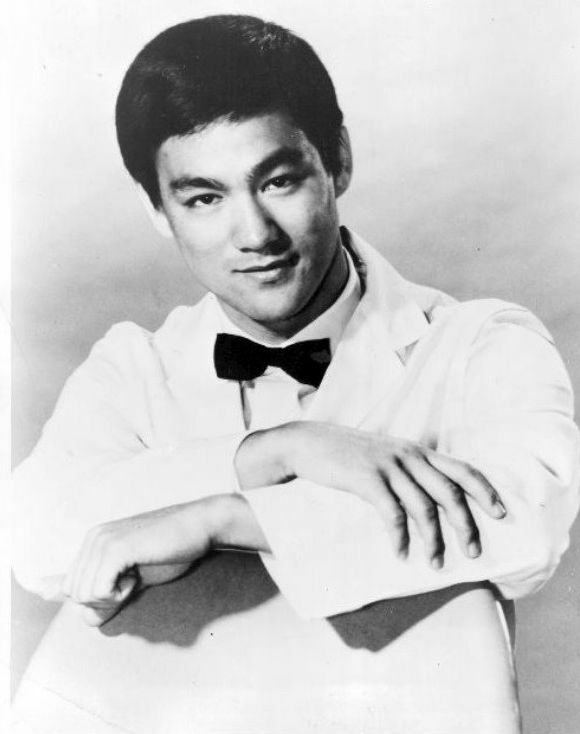 Lee appeared at the 1967 Long Beach International Karate Championships and performed various demonstrations, including the famous "unstoppable punch" against USKA world Karate champion Vic Moore. Lee allegedly told Moore that he was going to throw a straight punch to the face, and all he had to do was to try to block it. Lee took several steps back and asked if Moore was ready. When Moore nodded in affirmation, Lee glided towards him until he was within striking range. He then threw a straight punch directly at Moore's face, and stopped before impact. In eight attempts, Moore failed to block any of the punches. However, Moore and grandmaster Steve Mohammed claim that Lee had first told Moore that he was going to throw a straight punch to the body, which Moore blocked. Lee attempted another punch, and Moore blocked it as well. The third punch, which Lee threw to Moore's face, did not come nearly within striking distance. Moore claims that Lee never successfully struck Moore but Moore was able to strike Lee after trying on his own; Moore further claims that Bruce Lee said he was the fastest American he's ever seen and that Lee's media crew repeatedly played the one punch towards Moore's face that did not come within striking range, allegedly in an attempt to preserve Lee's superstar image. However, when viewing the video of the demonstration, it is clear that Mohammed and especially Moore were erroneous in their claims. In Oakland's Chinatown in 1964, Lee had a controversial private match with Wong Jack Man, a direct student of Ma Kin Fung, known for his mastery of Xingyiquan, Northern Shaolin, and T'ai chi ch'uan. According to Lee, the Chinese community issued an ultimatum to him to stop teaching non-Chinese people. When he refused to comply, he was challenged to a combat match with Wong. The arrangement was that if Lee lost, he would have to shut down his school, while if he won, he would be free to teach white people, or anyone else. Wong denied this, stating that he requested to fight Lee after Lee boasted during one of his demonstrations at a Chinatown theatre that he could beat anyone in San Francisco, and that Wong himself did not discriminate against Whites or other non-Chinese people. Lee commented, "That paper had all the names of the sifu from Chinatown, but they don't scare me". Individuals known to have witnessed the match include Cadwell, James Lee (Bruce Lee's associate, no relation), and William Chen, a teacher of T'ai chi ch'uan. Wong and William Chen stated that the fight lasted an unusually long 20�25 minutes. Wong claims that he had originally expected a serious but polite bout; however Lee had attacked him very aggressively with intent to kill, straight from the beginning of the bout when he had replied to Wong's traditional handshake offer by pretending to accept the handshake, but instead turning that hand into a spear aimed at Wong's eyes. Forced to defend his life, Wong had nonetheless refrained from striking Lee with killing force when the opportunity presented itself because it could earn him a prison sentence. The fight ended due to Lee's "unusually winded" condition, as opposed to a decisive blow by either fighter. According to Bruce Lee, Linda Lee Cadwell, and James Yimm Lee, however, the fight lasted a mere 3 minutes with a decisive victory for Lee. In Cadwell's account, "The fight ensued, it was a no-holds-barred fight, it took three minutes. 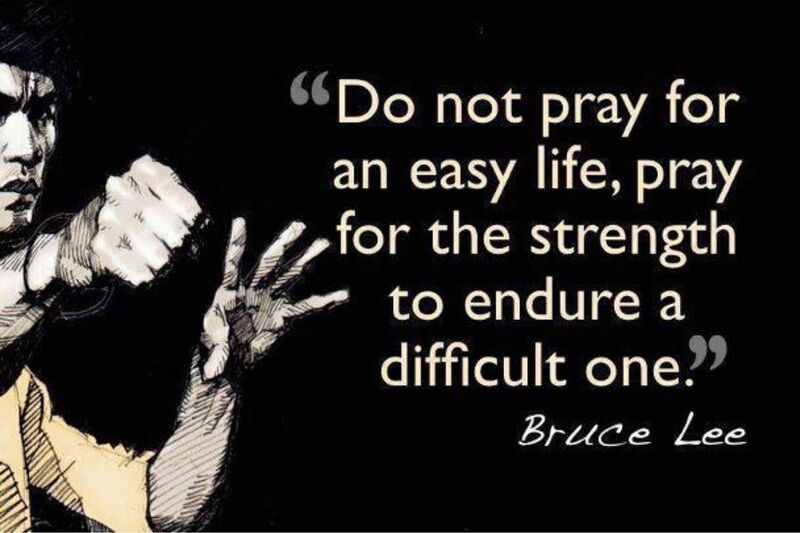 Bruce got this guy down to the ground and said 'Do you give up?' and the man said he gave up". A couple of weeks after the bout, Lee gave an interview claiming that he had defeated an unnamed challenger, which Wong says was an obvious reference to him. In response, Wong published his own account of the fight in the Chinese Pacific Weekly, a Chinese-language newspaper in San Francisco, with an invitation to a public rematch if Lee was not satisfied with the account. Lee did not respond to the invitation despite his reputation for violently responding to every provocation, and there were no further public announcements by either, though Lee continued to teach white people. 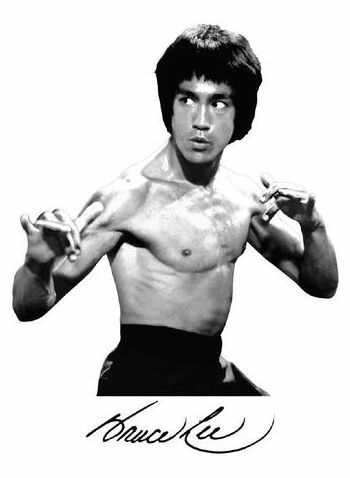 The Jeet Kune Do emblem is a registered trademark held by the Bruce Lee Estate. The Chinese characters around the Taijitu symbol read: "Using no way as way" and "Having no limitation as limitation" The arrows represent the endless interaction between yang and yin. Jeet Kune Do originated in 1967. 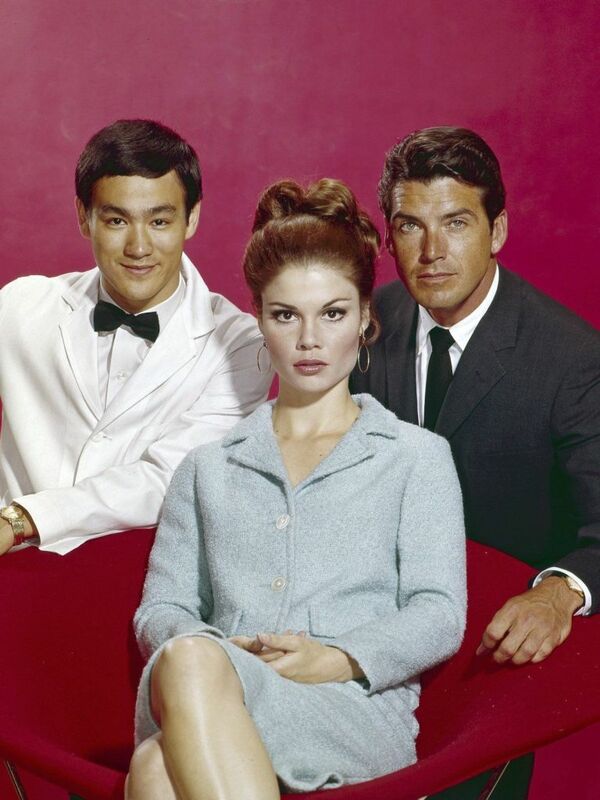 After filming one season of The Green Hornet, Lee found himself out of work and opened The Jun Fan Gung Fu Institute. The controversial match with Wong Jack Man influenced Lee's philosophy about martial arts. Lee concluded that the fight had lasted too long and that he had failed to live up to his potential using his Wing Chun techniques. He took the view that traditional martial arts techniques were too rigid and formalistic to be practical in scenarios of chaotic street fighting. Lee decided to develop a system with an emphasis on "practicality, flexibility, speed, and efficiency". He started to use different methods of training such as weight training for strength, running for endurance, stretching for flexibility, and many others which he constantly adapted, including fencing and basic boxing techniques. Lee emphasised what he called "the style of no style". This consisted of getting rid of the formalised approach which Lee claimed was indicative of traditional styles. Lee felt that even the system he now called Jun Fan Gung Fu was too restrictive, and it eventually evolved into a philosophy and martial art he would come to call Jeet Kune Do or the Way of the Intercepting Fist. It is a term he would later regret, because Jeet Kune Do implied specific parameters that styles connote, whereas the idea of his martial art was to exist outside of parameters and limitations. Training is one of the most neglected phases of athletics. Too much time is given to the development of skill and too little to the development of the individual for participation. ... JKD, ultimately is not a matter of petty techniques but of highly developed spirituality and physique. According to Linda Lee Cadwell, soon after he moved to the United States, Lee started to take nutrition seriously and developed an interest in health foods, high-protein drinks, and vitamin and mineral supplements. He later concluded that achieving a high-performance body was akin to maintaining the engine of a high-performance automobile. Allegorically, as one could not keep a car running on low-octane fuels, one could not sustain one's body with a steady diet of junk food, and with "the wrong fuel", one's body would perform sluggishly or sloppily. Lee also avoided baked goods and refined flour, describing them as providing empty calories that did nothing for his body. He was known for being a fan of Asian cuisine for its variance, and often ate meals with a combination of vegetables, rice, and fish, and drank fresh milk. Lee's father Lee Hoi-chuen was a famous Cantonese opera star. Because of this, Lee was introduced into films at a very young age and appeared in several films as a child. Lee had his first role as a baby who was carried onto the stage in the film Golden Gate Girl. By the time he was 18, he had appeared in twenty films. 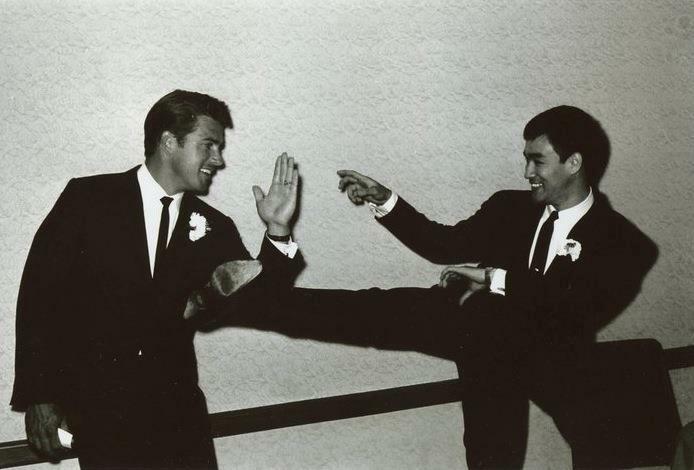 While in the United States from 1959 to 1964, Lee abandoned thoughts of a film career in favour of pursuing martial arts. However, a martial arts exhibition on Long Beach in 1964 eventually led to the invitation by William Dozier for an audition for a role in the pilot for "Number One Son". 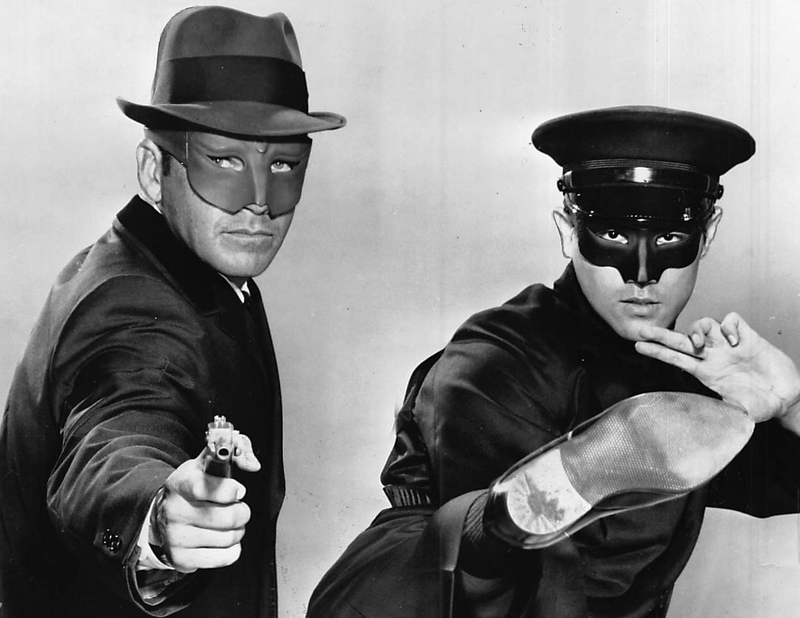 The show never aired, but Lee was invited for the role of the sidekick Kato alongside the title character played by Van Williams in the TV series titled The Green Hornet. The show lasted only one season of 26 episodes, from September 1966 to March 1967. Lee and Williams also appeared as their respective characters in three crossover episodes of Batman, another William Dozier-produced television series. This was followed by guest appearances in three television series: Ironside (1967), Here Come the Brides (1969), and Blondie (1969). 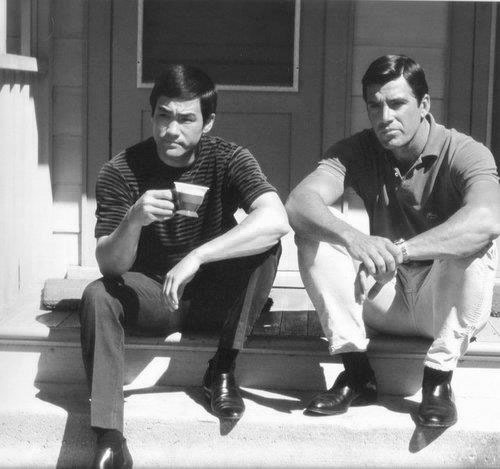 At the time, two of Lee's martial arts students were Hollywood script writer Stirling Silliphant and actor James Coburn. In 1969 the three worked on a script for a film called The Silent Flute, and went together on a location hunt to India. The project was not realised at the time, but the 1978 film Circle of Iron, starring David Carradine, was based on the same plot. In 2010, producer Paul Maslansky was reported to have planned and received funding for a film based on the original script for The Silent Flute. In 1969, Lee made a brief appearance in the Silliphant-penned film Marlowe, where he played a henchman hired to intimidate private detective Philip Marlowe, (played by James Garner), by smashing up his office with leaping kicks and flashing punches, only to later accidentally jump off a tall building while trying to kick Marlowe off. The same year he also choreographed fight scenes for The Wrecking Crew starring Dean Martin, Sharon Tate, and featuring Chuck Norris in his first role. In 1970, he was responsible for fight choreography for A Walk in the Spring Rain starring Ingrid Bergman and Anthony Quinn, again written by Silliphant. In 1971, Lee appeared in four episodes of the television series Longstreet, written by Silliphant. Lee played the martial arts instructor of the title character Mike Longstreet (played by James Franciscus), and important aspects of his martial arts philosophy were written into the script. According to statements made by Lee, and also by Linda Lee Cadwell after Lee's death, in 1971 Lee pitched a television series of his own tentatively titled The Warrior, discussions of which were also confirmed by Warner Bros. During a December 9, 1971 television interview on The Pierre Berton Show, Lee stated that both Paramount and Warner Brothers wanted him "to be in a modernized type of a thing, and that they think the Western idea is out, whereas I want to do the Western". According to Cadwell, however, Lee's concept was retooled and renamed Kung Fu, but Warner Bros. gave Lee no credit. Warner Brothers states that they had for some time been developing an identical concept, created by two writers and producers, Ed Spielman and Howard Friedlander. According to these sources, the reason Lee was not cast was in part because of his ethnicity, but more so because he had a thick accent. The role of the Shaolin monk in the Wild West was eventually awarded to then-non-martial-artist David Carradine. In The Pierre Berton Show interview, Lee stated he understood Warner Brothers' attitudes towards casting in the series: "They think that business-wise it is a risk. I don't blame them. If the situation were reversed, and an American star were to come to Hong Kong, and I was the man with the money, I would have my own concerns as to whether the acceptance would be there". Producer Fred Weintraub had advised Lee to return to Hong Kong and make a feature film which he could showcase to executives in Hollywood. Not happy with his supporting roles in the US, Lee returned to Hong Kong. 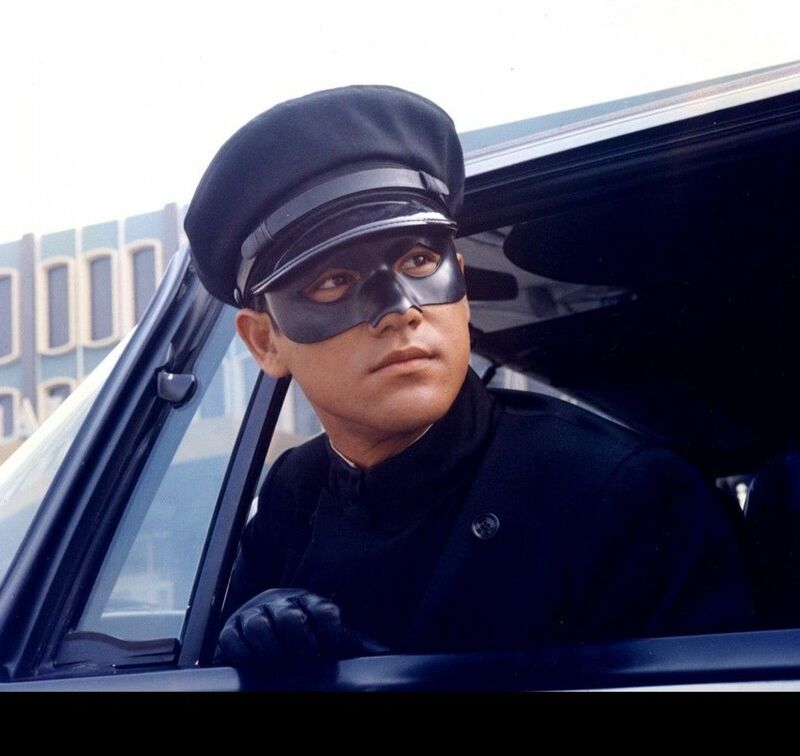 Unaware that The Green Hornet had been played to success in Hong Kong and was unofficially referred to as "The Kato Show", he was surprised to be recognised on the street as the star of the show. 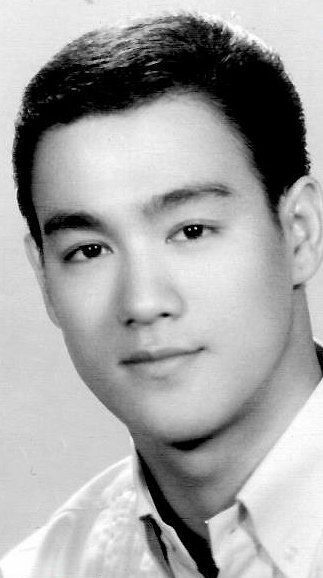 After negotiating with both Shaw Brothers Studio and Golden Harvest, Lee signed a film contract to star in two films produced by Golden Harvest. Lee played his first leading role in The Big Boss (1971), which proved to be an enormous box office success across Asia and catapulted him to stardom. He soon followed up with Fist of Fury (1972), which broke the box office records set previously by The Big Boss. Having finished his initial two-year contract, Lee negotiated a new deal with Golden Harvest. Lee later formed his own company, Concord Production Inc. (?????? ), with Chow. 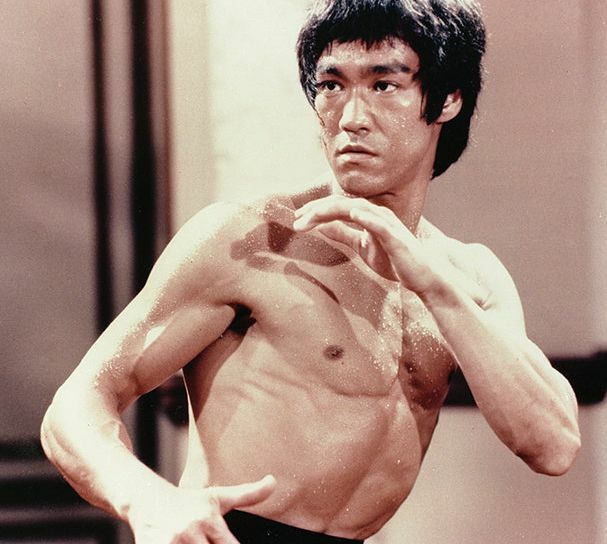 For his third film, Way of the Dragon (1972), he was given complete control of the film's production as the writer, director, star, and choreographer of the fight scenes. In 1964, at a demonstration in Long Beach, California, Lee had met Karate champion Chuck Norris. 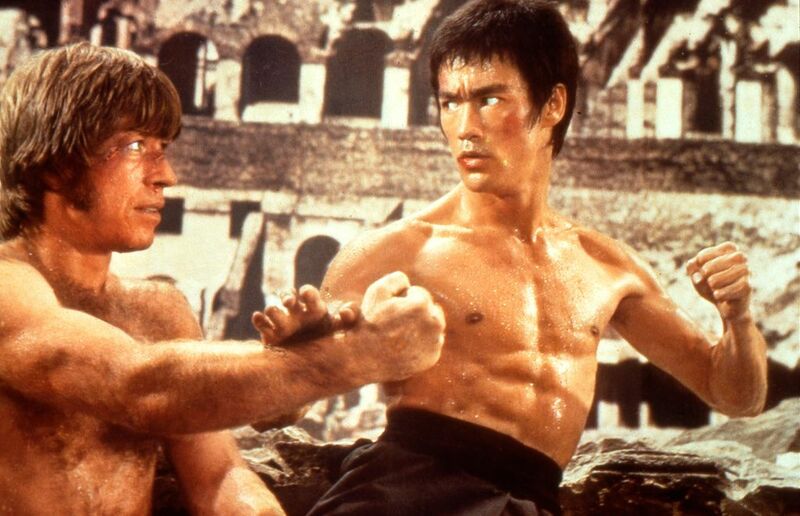 In Way of the Dragon Lee introduced Norris to movie-goers as his opponent in the final death fight at the Colosseum in Rome, today considered one of Lee's most legendary fight scenes and one of the most memorable fight scenes in martial arts film history. The role was originally offered to American Karate champion Joe Lewis. From August to October 1972, Lee began work on his fourth Golden Harvest Film, Game of Death. He began filming some scenes, including his fight sequence with 7 ft 2 in (218 cm) American Basketball star Kareem Abdul-Jabbar, a former student. 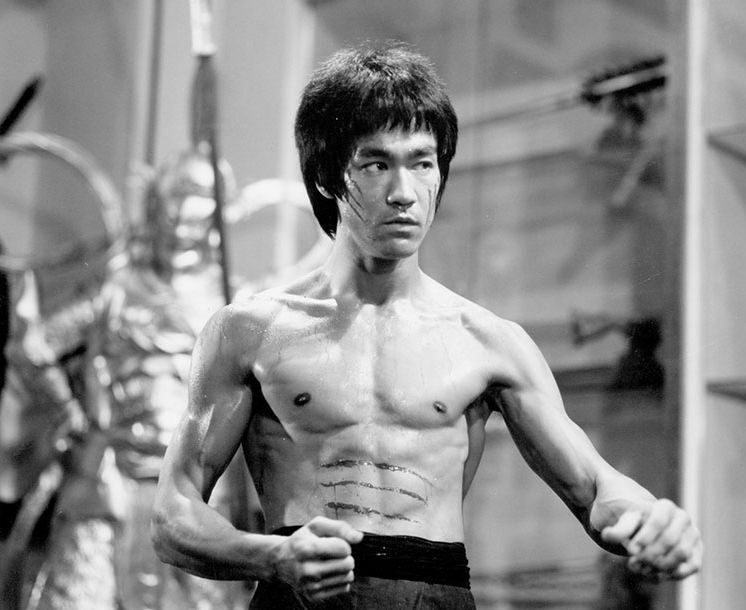 Production stopped in November 1972 when Warner Brothers offered Lee the opportunity to star in Enter the Dragon, the first film to be produced jointly by Concord, Golden Harvest, and Warner Bros. Filming began in Hong Kong in January 1973. 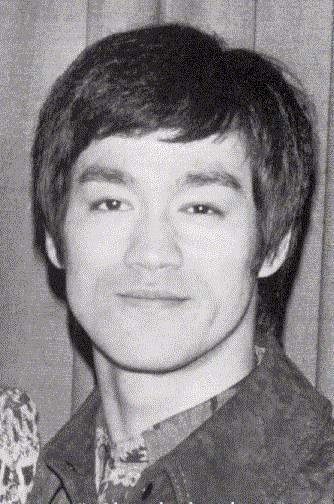 One month into the filming, another production company, Starseas Motion Pictures, promoted Bruce Lee as a leading actor in Fist of Unicorn, although he had merely agreed to choreograph the fight sequences in the film as a favour to his long-time friend Unicorn Chan. Lee planned to sue the production company, but retained his friendship with Chan. However, only a few months after the completion of Enter the Dragon, and six days before its July 26, 1973 release, Lee died. 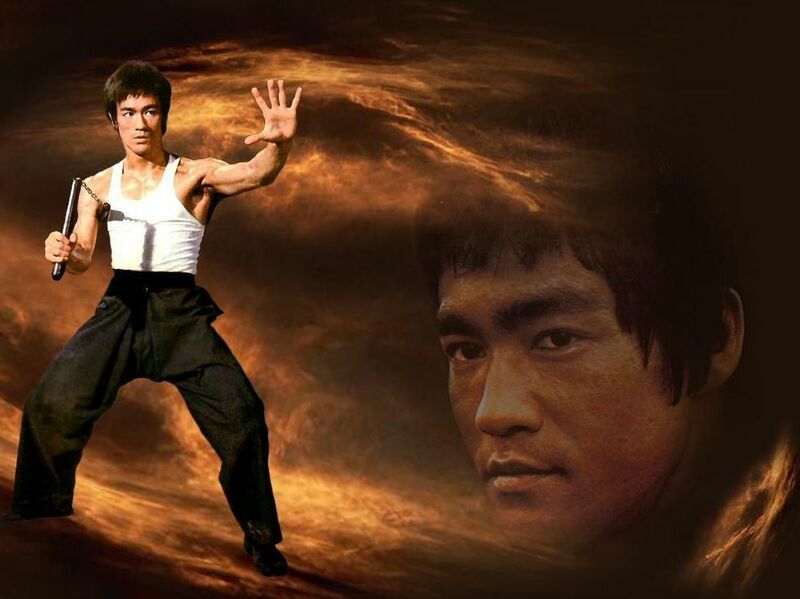 Enter the Dragon would go on to become one of the year's highest-grossing films and cement Lee as a martial arts legend. It was made for US$850,000 in 1973 (equivalent to $4 million adjusted for inflation as of 2007). To date, Enter the Dragon has grossed over $200 million worldwide. 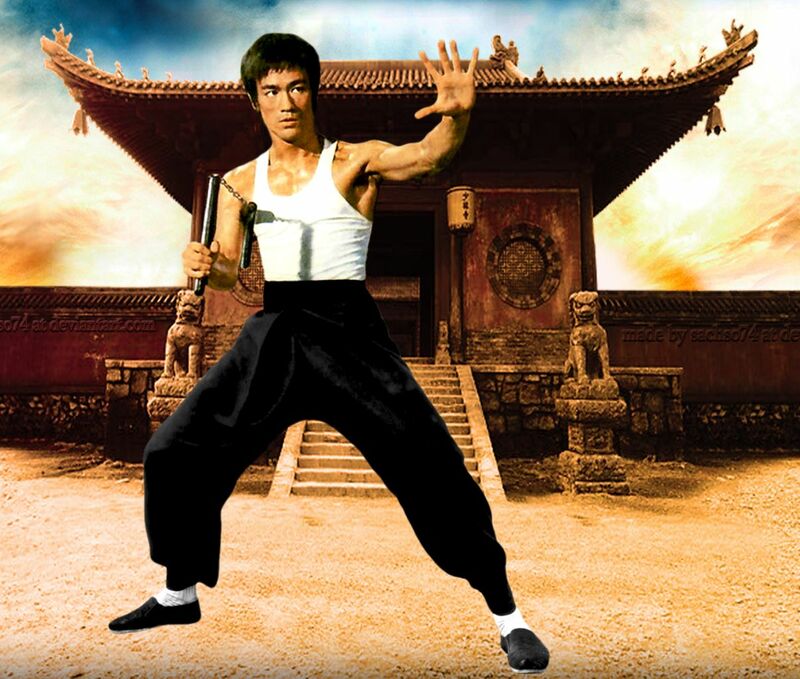 The film sparked a brief fad in martial arts, epitomised in songs such as "Kung Fu Fighting" and TV shows like Kung Fu. Robert Clouse, the director of Enter the Dragon, together with Golden Harvest, revived Lee's unfinished film Game of Death. 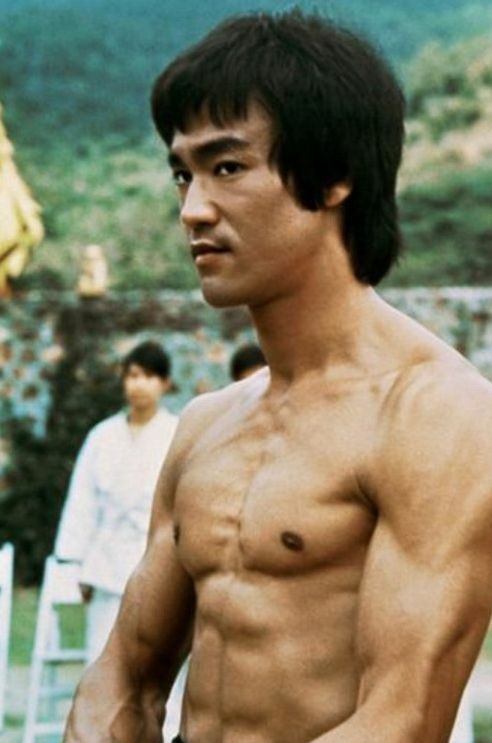 Lee had shot over 100 minutes of footage, including out-takes, for Game of Death before shooting was stopped to allow him to work on Enter the Dragon. In addition to Abdul-Jabbar, George Lazenby, Hapkido master Ji Han-Jae, and another of Lee's students, Dan Inosanto, were also to appear in the film, which was to culminate in Lee's character, Hai Tien (clad in the now-famous yellow track suit) taking on a series of different challengers on each floor as they make their way through a five-level pagoda. In a controversial move, Robert Clouse finished the film using a look-alike and archive footage of Lee from his other films with a new storyline and cast, which was released in 1978. However, the cobbled-together film contained only fifteen minutes of actual footage of Lee (he had printed many unsuccessful takes) while the rest had a Lee look-alike, Kim Tai Chung, and Yuen Biao as stunt double. The unused footage Lee had filmed was recovered 22 years later and included in the documentary Bruce Lee: A Warrior's Journey. 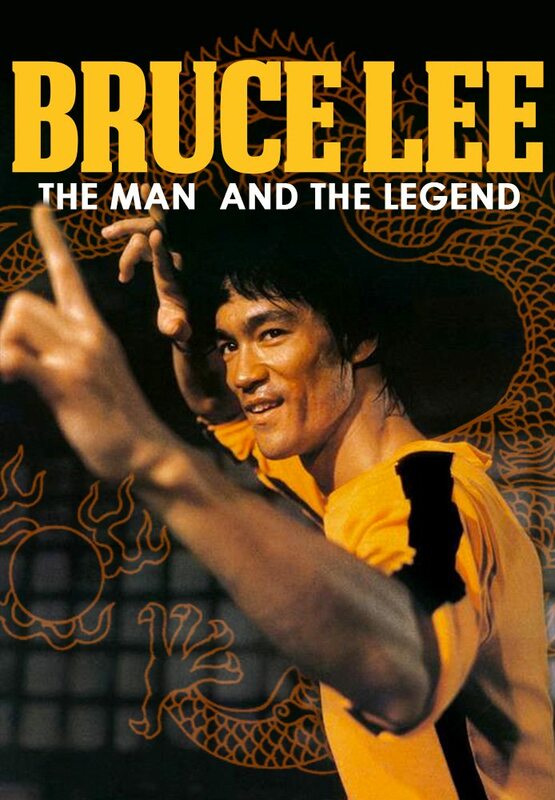 Apart from Game of Death, other future film projects were planned to feature Lee at the time. In 1972, after the success of The Big Boss and Fist of Fury, a third film was planned by Raymond Chow at Golden Harvest to be directed by Lo Wei, titled Yellow-Faced Tiger. However, at the time, Lee decided to direct and produce his own script for Way of the Dragon instead. Although Lee had formed a production company with Raymond Chow, a period film was also planned from September�November 1973 with the competing Shaw Brothers Studio, to be directed by either Chor Yuen or Cheng Kang, and written by Yi Kang and Chang Cheh, titled The Seven Sons of the Jade Dragon. Lee had also worked on several scripts himself. A tape containing a recording of Lee narrating the basic storyline to a film tentatively titled Southern Fist/Northern Leg exists, showing some similarities with the canned script for The Silent Flute (Circle of Iron). Another script had the title Green Bamboo Warrior, set in San Francisco, planned to co-star Bolo Yeung and to be produced by Andrew Vajna who later went on to produce First Blood. Photoshoot costume tests were also organized for some of these planned film projects. 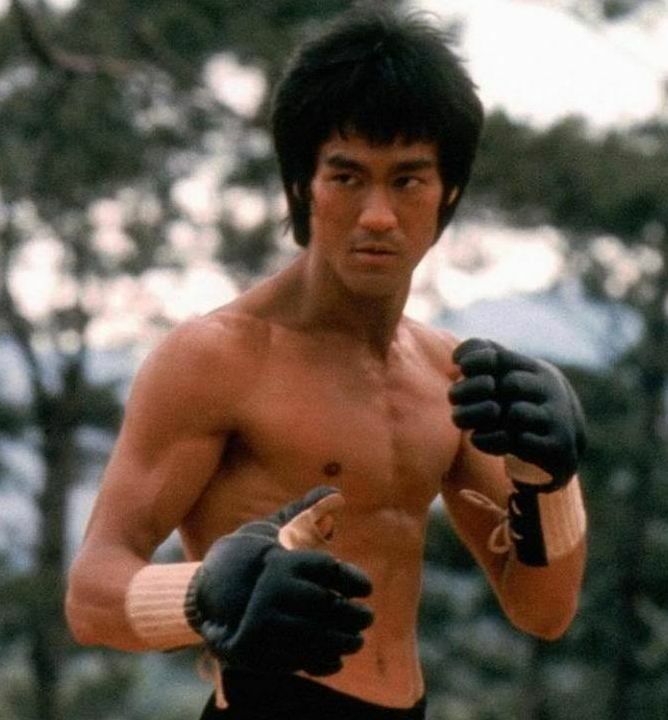 Lee is best known as a martial artist, but he also studied drama and Asian and Western philosophy while a student at the University of Washington and throughout his life. He was well-read and had an extensive library dominated by martial arts subjects and philosophical texts. His own books on martial arts and fighting philosophy are known for their philosophical assertions, both inside and outside of martial arts circles. His eclectic philosophy often mirrored his fighting beliefs, though he was quick to claim that his martial arts were solely a metaphor for such teachings. He believed that any knowledge ultimately led to self-knowledge, and said that his chosen method of self-expression was martial arts. His influences include Taoism, Jiddu Krishnamurti, and Buddhism. Lee's philosophy was very much in opposition to the conservative worldview advocated by Confucianism. John Little states that Lee was an atheist. When asked in 1972 about his religious affiliation, he replied, "none whatsoever", and when asked if he believed in God, he said, "To be perfectly frank, I really do not." Aside from martial arts and philosophy which focus on the physical aspect and self-consciousness for truths and principles, Lee also wrote poetry that reflected his emotion and a stage in his life collectively. Many forms of art remain concordant with the artist creating them. 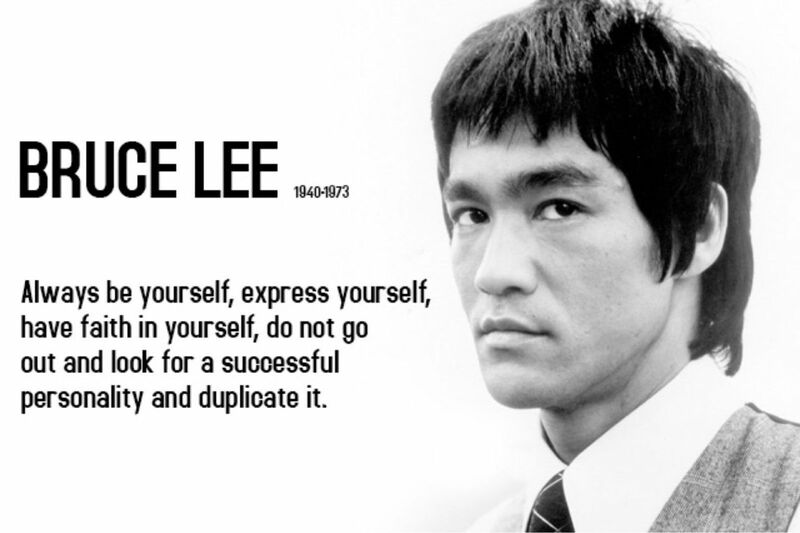 Lee's principle of self-expression was applied to his poetry as well. 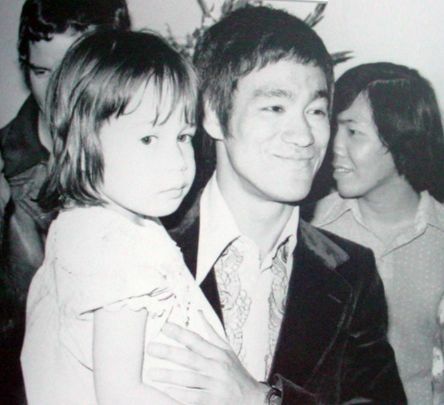 His daughter Shannon Lee said, "He did write poetry, he was really the consummate artist." His poetic works were originally handwritten on paper, then later on edited and published, with John Little being the major author (editor), for Bruce Lee's works. 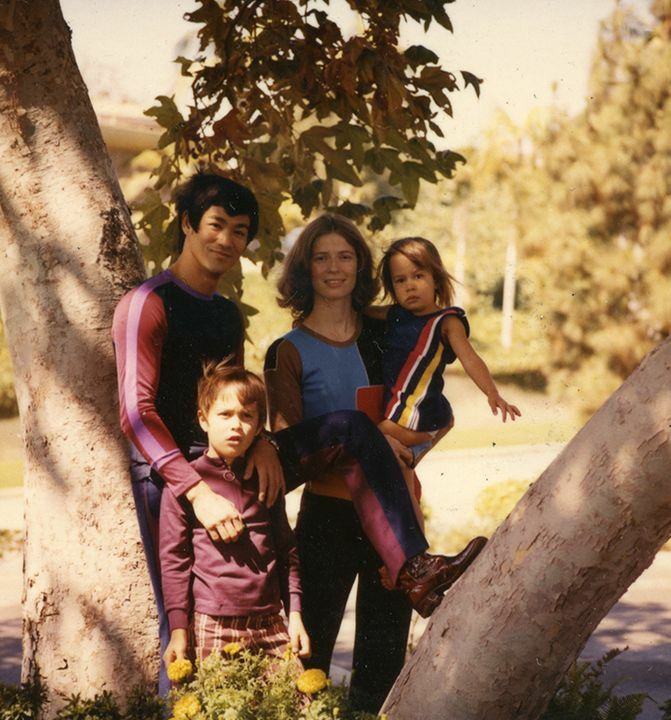 Linda Lee Cadwell (Bruce Lee's wife) shared her husband's notes, poems and experiences with followers. She mentioned "Lee's poems are, by American standards, rather dark--reflecting the deeper, less exposed recesses of the human psyche". 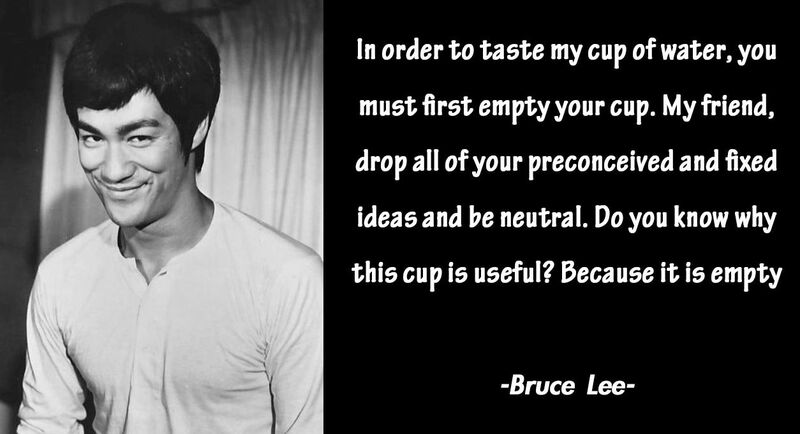 Most of Bruce Lee's poems are categorized as anti-poetry or fall into a paradox. The mood in his poems shows the side of the man that can be compared with other poets such as Robert Frost, one of many well-known poets expressing himself with dark poetic works. The paradox taken from the Yin and Yang symbol in martial arts, also integrated in his poetry. His martial arts and philosophy contribute a great part to his poetry. The free verse form of Lee's poetry reflects his famous quote "Be formless � shapeless, like water." On May 10, 1973, Lee collapsed during an automated dialogue replacement session for Enter the Dragon at Golden Harvest in Hong Kong. Suffering from seizures and headaches, he was immediately rushed to Hong Kong Baptist Hospital where doctors diagnosed cerebral edema. They were able to reduce the swelling through the administration of mannitol. The headache and cerebral edema that occurred in his first collapse were later repeated on the day of his death. On July 20, 1973, Lee was in Hong Kong, to have dinner with actor George Lazenby, with whom he intended to make a film. According to Lee's wife Linda, Lee met producer Raymond Chow at 2 p.m. at home to discuss the making of the film Game of Death. They worked until 4 p.m. and then drove together to the home of Lee's colleague Betty Ting Pei, a Taiwanese actress. The three went over the script at Ting's home, and then Chow left to attend a dinner meeting. Later Lee complained of a headache, and Ting gave him an analgesic, Equagesic, which contained both aspirin and the tranquilizer meprobamate. Around 7:30 p.m., he went to lie down for a nap. When Lee did not come for dinner, producer Raymond Chow came to the apartment, but was unable to wake Lee up. A doctor was summoned, who spent ten minutes attempting to revive Lee before sending him by ambulance to Queen Elizabeth Hospital. By the time the ambulance reached the hospital, he was dead. He died at age 32. There was no visible external injury; however, according to autopsy reports, Lee's brain had swollen considerably, from 1,400 to 1,575 grams (a 13% increase). The autopsy found Equagesic in his system. On October 15, 2005, Chow stated in an interview that Lee died from an allergic reaction to the tranquilizer meprobamate, the main ingredient in Equagesic, which Chow described as an ingredient commonly used in painkillers. When the doctors announced Lee's death officially, it was ruled a "death by misadventure". 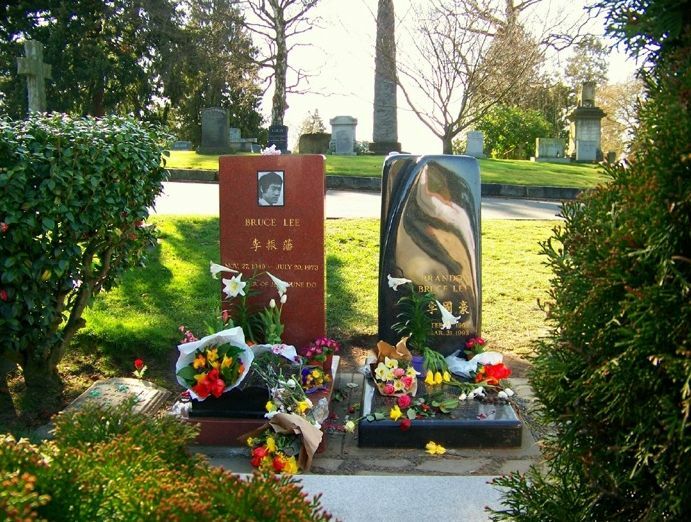 Lee's wife Linda returned to her hometown of Seattle, and had Lee's body buried in Lot 276 of Lake View Cemetery in Seattle. Pallbearers at Lee's funeral on July 25, 1973, included Taky Kimura, Steve McQueen, James Coburn, Chuck Norris, George Lazenby, Dan Inosanto, Peter Chin, and Lee's brother Robert. Around the time of Lee's death, numerous rumors appeared in the media. Lee's iconic status and untimely demise fed many wild rumors and theories. These included murder involving the triads and a supposed curse on him and his family. Although there was initial speculation that cannabis found in Lee's stomach may have contributed to his death, Teare refuted this, stating that it would "be both 'irresponsible and irrational' to say that [cannabis] might have triggered either the events of Bruce's collapse on May 10 or his death on July 20". Dr. R. R. Lycette, the clinical pathologist at Queen Elizabeth Hospital, reported at the coroner hearing that the death could not have been caused by cannabis. At the 1975 San Diego Comic-Con convention, Bruce Lee's friend Chuck Norris attributed his death to a reaction between the muscle-relaxant medication he had been taking since 1968 for a ruptured disc in his back, and an "antibiotic" he was given for his headache on the night of his death. In a 2017 episode of the Reelz TV series Autopsy, forensic pathologist Dr. Michael Hunter theorized that Lee died of adrenal crisis brought on by the overuse of cortisone, which Lee had been taking since injuring his back in a 1970 weight lifting mishap. Dr. Hunter believes that Lee's exceptionally strong "drive and ambition" played a fundamental role in the martial artist's ultimate demise.